Weather alerts are for every individual or business affected by the weather on a daily basis. It allows for best preparation for weather disturbances (storms, thunderstorms, freezing rain, freezing temperatures, etc.) and therefore avoids the mess that such weather conditions could entail. 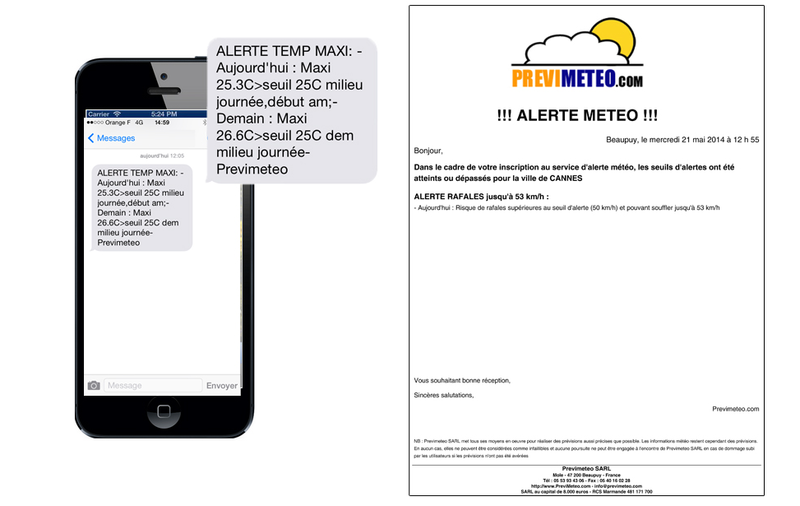 At Previmeteo, we offer a service that allows you to receive weather alerts by SMS, Email, Fax or even by notification. You tell us for which cities and which weather parameters you would like to receive alerts. You define the thresholds for the following parameters: wind, gusts, accumulation of precipitation, and temperatures. When the forecast calls for one of your parameters passing the indicated threshold, you will receive an alert 24 hours in advance. You receive the second update alert 12 hours before the phenomenon.